Toilet training a puppy seems to present all sorts of problems to dog owners. This handout sets out a programme of training that is effective and stress free for both you and your pup. Some points to be aware of before you start. 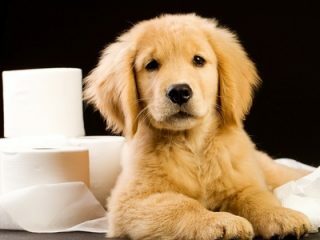 Young pups are not physically developed to go for long periods without toileting. Dogs are creatures of habit – they will tend to “perform” in the same place over and over again. Paper training is ineffective – it involves teaching your dog that it is acceptable to go in the house (on the paper) and then trying to change this behaviour at a later date. Punishment does not work – if you punish a young pup for going in the wrong place, you may teach them to fear you. This could result in a dog that simply will not go when you are close by, but will happily “perform” on the best carpet when left alone. House training is high on the list of benefits for using a crate. Dogs are “den” animals and readily adapt to sleeping and resting in a crate that replicates a den. Keep the crate in a busy convenient location such as the kitchen or any other room where the family spends a lot of time. This means that you will be taking the pup out many times during each day. If he “performs”, you must reward him with treats, play and praise. On those occasions when he does not “perform”, let him return quietly indoors. This is not a waste of time – simply a way of making sure that he is in the right place when he needs to be. The pup will soon start to move towards the door when he needs to toilet – so watch carefully and be sure to give him lots of reward for “telling” you. You can encourage the pup to perform by tossing a few pieces of food near the place you want him to use as a toilet. Sniffing for the food will often trigger him to go. You may feel that this seems a lot of work but you will reap the benefits very quickly. As your pup becomes more predictable in his behaviour, you should give him a signal (e.g. “hurry up” or “be quick”) that can be used as a command to perform when he is older and has more physical control. 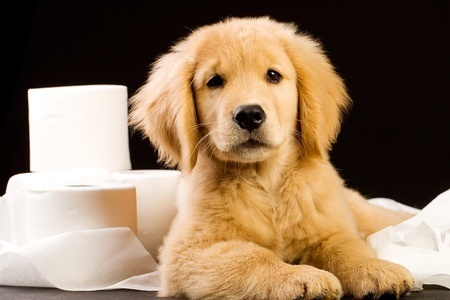 If you are feeding your pup regularly, you will soon pick up on his toilet pattern. So observe your pup carefully and adjust your programme accordingly. Under no circumstances should you ever punish your pup. Do not use any cleaning agent that contains ammonia or bleach, as this will not remove the smell of uric acid. In fact it will add to it. This will attract the puppy back to the same spot and the smell will stimulate a dog. There are specific products available from your vet or pet store, or you can use biological soap powder or warm water with vinegar. Despite the above advice, some problems can still occur. Some nervous puppies or those who are not very confident may find it difficult to relax enough to toilet outside. This will be overcome by good socialisation but you should also make sure that you do not become anxious or show any annoyance with the pup. Health problems can result in inappropriate toileting, but this is rare and can be treated quickly and effectively. If you are in any doubt whatsoever, please seek advice from a veterinary surgeon. AS WITH ALL TRAINING AND TEACHING, PATIENCE AND CONSISTENCY ARE VERY IMPORTANT. THE ABOVE PROGRAMME HAS PROVED EFFECTIVE MANY TIMES OVER. USED PROPERLY IT WILL TEACH YOUR PUP QUICKLY AND WITHOUT STRESS FOR EITHER YOU OR THE PUP.